The ruling party Biju Janata Dal (BJD), seems to be confident about winning a fifth consecutive term in the assembly polls because of the personality of its party president and Chief Minister Naveen Patnaik. This, and the populist schemes implemented by the state government for the benefit of almost all segments of society. The Bharatiya Janata Party (BJP) expects that its success in the 2017 panchayat polls will go further in the 2019 elections under the influence of the ‘Modi magic’. Though the strong Modi wave of 2014 couldn’t fetch any significant benefit for the party’s state chapter, his persona may work well this time “because of his work for social and economic development of the country,” said a senior BJP leader seeking anonymity. Out of power since 2000, the state unit of the Indian National Congress (INC) is working aggressively for a makeover, to face the forthcoming elections with fresh energy within its ranks and files. Although the party has been following a declining trend in Odisha since 2000, leaders of the party believe that a revival through the current makeover exercise added with an aggressive campaign, can place the party as a strong political force by the time the 2019 elections approach. Surprisingly, neither BJD nor BJP considers INC as a political threat or an important competitor despite the fact that the INC was the second largest as well as the Opposition party in the assembly with 16 seats out of 147, while BJP was the third with only 10 seats. 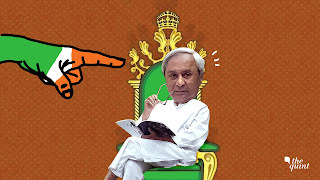 In terms of vote share, BJD remained at the top in the vote tally of the 2014 assembly elections in Odisha, with 43.35 percent total valid votes, while INC got 25.71 percent, leaving BJP at the third position with 17.99 percent. However, the INC saw a decline from the 2009 tally where its vote share was 29.10 percent. But BJD and BJP on the other hand saw a growth from 38.86 percent and 15.05 percent respectively. In the 2014 Lok Sabha elections, which were conducted simultaneously with the assembly polls, the BJD had a share of 44.77 percent valid votes against INC’s 26.38 percent and BJP’s 21.88 percent. In less than three years, in the panchayat elections of 2017, BJP emerged as the main contender (against BJD) by winning in 297 zila parishad (ZP) zones out of a total of 853. In 2012, the party had been able to win in only 36 zones. The panchayat election result came as a shocker to the ruling BJD, though it retained its top spot. From a whopping 654 in 2012, it plummeted to 473 in 2017. The INC’s performance was poor in the panchayat polls. It could bag only 60 zones as opposed to the 128 it won in 2012. Barely a year after this, the victory of BJD’s Rita Sahu by a margin over 40,000 votes against the BJP candidate in the Bijepur by-election, came as a boost for the BJD. The result was however quite bitter for the BJP and Union Minister Dharmendra Pradhan, who led the campaign after being perceived as the chief ministerial face of the party. The Congress again performed abysmally in the election, calling for serious introspection and immediate action for course correction. During the panchayat polls of 2017, political experts believe that a part of the traditional Congress votes went to the BJP to bring it its unexpected success. But in the Bijepur by-election, the trend didn’t remain so because the Congress votes went to the BJD, as its candidate, Rita Sahu, happened to be the wife of Congress MLA Subal Sahu, whose death led to the by-election. The sympathy factor and the INC’s inability to field a proper candidate, went in favour of the BJD. So, as the trend itself suggests, Congress votes played the main role in the successes of the other two political parties since the 2009 elections that preceded the split in the BJD-BJP coalition, which formed the government in Odisha from 2000 to 2009. Now, in order to fulfill its dreams of performing big, the BJP needs to bring a part of the Congress votes to its fold, while expecting the benefits of the anti-incumbency factor. The BJD too may try to realise its dream of coming to power for a fifth term, bringing more Congress votes to its side, to counter the anti-incumbency factor. As BJD has already tried it to win the Bijepur by-election, the BJP seems to be replicating the same in many assembly constituencies. Keeping this in mind, and in order to reverse the declining trend, the Pradesh Congress Committee (PCC) in the state has already started its makeover exercises. It has brought many fresh youthful faces from different walks of life to its fold who are becoming more acceptable to the public. “The leadership also wants to include youth faces while selecting candidates for the coming elections,” said Satya Prakash Nayak, a popular face from the media sector who now chairs the media committee of the party in the state. With youth and intellectuals showing interest in the party, the scenario seems to be changing for the INC in Odisha. “We have taken up the farmers’ issues and different social issues concerning people living in rural Odisha,” Nayak added. If it works, which looks possible with the changes that have been brought about, the trend may cease to decline further, and even reverse with the migrated Congress votes returning to the Congress. In such a situation, the first casualty will be the BJP, which will not only fail to attract Congress votes, but also its vote share may decrease with migrated Congress votes returning to the original party fold. The BJD vote share may also fall, with the Congress votes returning to its original fold. Anti-incumbency being a strong factor in Indian elections, the INC may emerge as a strong power and give the BJD a tough fight in the 2019 elections, if things go as expected. This piece first appeared on TheQuint, on Nov 19, 2018.
have to say. Actually hardly ever do I encounter a weblog that each educative and entertaining, and let me inform you, you will have hit the nail on the head.you can refer panseva for applying new pan card Your concept is excellent; the difficulty is one thing that not sufficient people are talking intelligently about.